The following forms are printer-friendly, blank PDF forms which can easily be printed and completed by hand, and then faxed or mailed to LAWPRO. To file them electronically instead go to My LAWPRO. You can also order copies of LAWPRO materials. Online filing for the 2019 insurance program begins October 1. 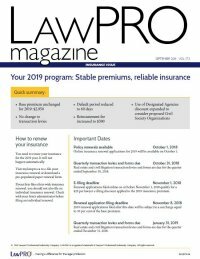 Paper applications will not be automatically sent by regular mail, however pre-populated renewal application forms will be available for download from the “primary policy documents” tab in My LAWPRO (at the top right corner of this page) on or about October 1. To access the online application form, enter your Law Society number and your e-filing password. If you cannot remember that password or need to set up a new one, follow the online instructions or contact Customer Service at 416-598-5899 or 1-800-410-1013 for assistance.